Our process is subject to strict quality assurance in our testing laboratory. The quality controls meet the DIN recommendation for testing treatment success of deacidification processes and include measurements that go beyond the standard. 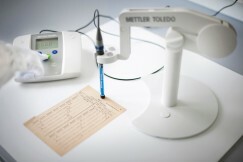 In addition to analysis with standardised test papers, routine quality checks can be performed on original materials. We are particularly keen to point out that the tests cause absolutely no damage to the originals. The success of treatment, measured by its intensity and homogeneity, is determined using x-ray fluorescence spectroscopy (XRF). XRF detects the presence of the active ingredient, magnesium carbonate, both on the surface and in the interior of paper sheets. The completeness of deacidification (pH ≥ 7) is checked by determining the surface pH value and colour changes can be detected. All of the treatment results are entered in a test certificate turned over to the customer following the treatment.